I had no - and I mean ZERO - prior knowledge of the teachings of Socrates, Plato, and Aristotle. I had ZERO familiarity with the rhetoric vs. dialectic debate, that apparently has been ongoing for some 2,400 years. And I have ZERO intention of digging further into these subjects. Most of all, I couldn't understand why the antagonist-turned-protagonist, Phaedrus, was so hung up on this thing called "Quality". Towards the end of the book, Phaedrus acknowledges that there is nowhere left to go, nothing left to do, and that this may have been all for not. My thoughts exactly! Why would someone waste so much time taking on such a monumental yet hopeless task as reversing Western thought - by sticking it to one arrogant professor? Phaedrus' obsession with developing his thesis, I'm sure, resonates within some specific groups, but just not for me. I was left wondering what he was hoping to accomplish, besides maybe notoriety. Did he really think Western civilization was going to about-face because he proved to himself that he had it figured out? Yes, he was definitely insane. A buddy of mine summarized it accurately, in my opinion (paraphrased): "People read it as a sort of right of passage - to SAY they read it. It makes them feel smarter that they finished it." Dead on. Obviously, we're on the wrong side of this one, as the book has become a bestseller and "is generally regarded as an American cultural icon in literature" according to Wikipedia. I'm not a deep enough thinker for this book, I'll give you that. I understand that there is much more to the book than I give it credit for. For example, I understand that, at the time it was written (1970's), mental illness was a stigma - and, even though we've made progress as a society on that front, it still is to some extent. 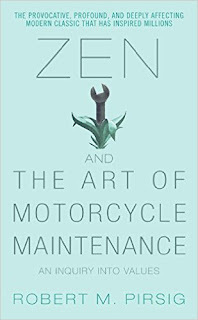 Zen brought it to the forefront. 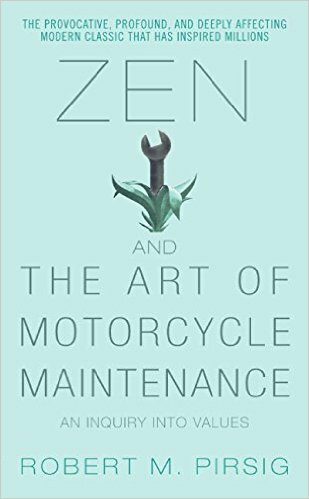 Also, it does provide some interesting discussion on technology and the art vs. science - but every time it seemed like it started coming together and something valuable was to be learned, Pirsig took off on another tangent on his Chautauqua and lost me. Oh well. -"When analytic thought, the knife, is applied to experience, something is always killed in the process. That is fairly well understood, at least in the arts. Mark Twain's experience comes to mind, in which, after he had mastered the analytic knowledge needed to pilot the Mississippi River, he discovered the river had lost its beauty. Something is always killed. But what is less noticed in the arts - something is always created too. And instead of just dwelling on what is killed it's important also to see what's created and to see the process as a kind of death-birth continuity that is neither good nor bad, but just is." -“You’ve got to live right, too. 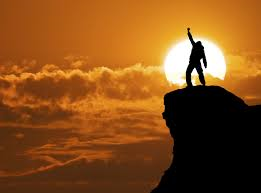 It’s the way you live that predisposes you to avoid the traps and see the right facts. You want to know how to paint a perfect painting? It’s easy. Make yourself perfect and then just paint naturally. That’s the way all the experts do it. The making of a painting or the fixing of a motorcycle isn’t separate from the rest of your existence. If you’re a sloppy thinker the six days of the week you aren’t working on your machine, what trap avoidances, what gimmicks, can make you all of a sudden sharp on the seventh? It all goes together. "But if you're a sloppy thinker six days a week and you really try to be sharp on the seventh, then maybe the next six days aren't going to be quite as sloppy as the preceding six. What I'm trying to come up with on these gumption traps, I guess, is shortcuts to living right.